If the Pixel 3 “Made By Google” launch event reminds us of anything, it’s that basic hardware specs don’t mean much in Googleland. We’ve long known that the Pixel 3 (starting at $799) and Pixel 3 XL (starting at $899) would have 5.5-inch and 6.3-inch displays respectively, along with dual front cameras. And all that was confirmed today. Top Shot is Google’s machine-learning strategy for making sure you never miss the perfect photo. In a nutshell, the 12.2-megapixel camera takes multiple HDR+ images in rapid succession, and then applies all it’s discovered from machine-learning analysis to suggest the perfect shot from the group. By taking a burst of images and recommending the very best, Top Shot is designed to make sure you never have to settle for an eyes-closed photo again. This should help eliminate all those images of people with their eyes closed, dogs who turn away from the camera at the last moment, and even some bird photo-bombing your frame. You can also scroll through alternate images, and save that particularly awkward image of your spouse in mid-duckface. Should you choose to do so. For years and years, we tech journalists have warned of the compromises of “digital zoom,” a software technique that approximates the mechanical zoom of a telephoto lens, but always ends up in crap-looking images with lots of noise. 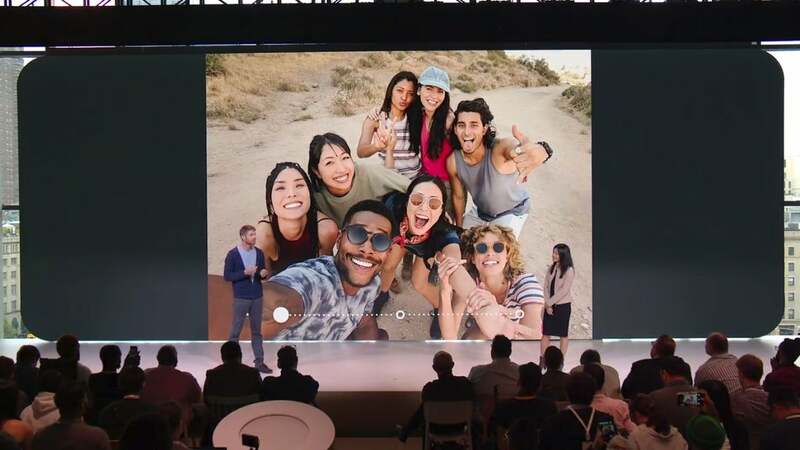 But now Google says that by using machine learning via its Super Res Zoom feature, you can in fact get a clean, noise-free image with what is effectively digital zoom. Will Super Res Zoom really reinvent digital zoom? We can’t wait to test this feature. This feature also taps into a burst of multiple images, and then uses Google’s Pixel Visual Core chip to composite a blur-free photo. On paper, this is a big promise—so we can’t wait to test Google’s claims and study some Super Res Zoom images very carefully. Night Sight completes the triumvirate of fancy new “computational photos” that Google is ushering in with the Pixel 3 (and will supposedly trickle down to earlier Pixel models). To some degree or another, all smartphones struggle with low-light environments, and if you know anything about photography at all, you know turning on flash is never the answer. Now here’s a Google burn! But let’s see how Night Sight performs during testing. 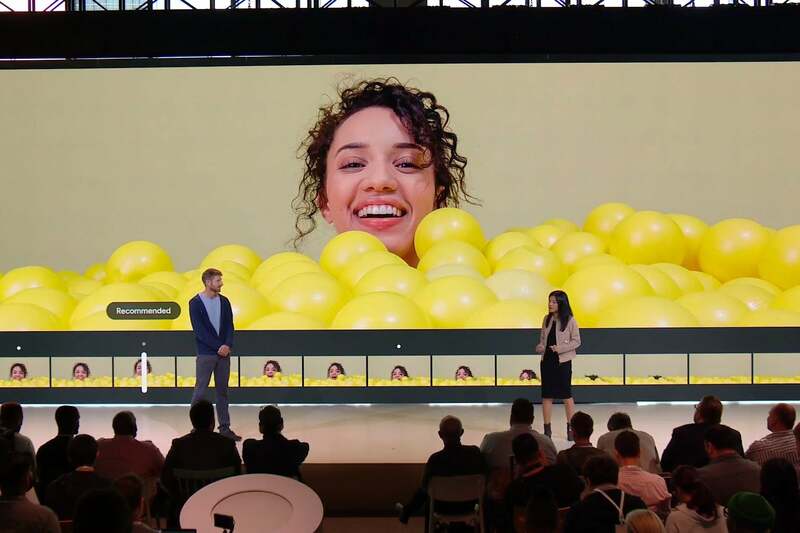 Enter Night Sight, which uses machine-learning to choose just the right pixel information, and push up brightness, detail, and color in whatever final photo Google’s algorithms have prescribed for the shot at hand. Google side-by-side demo images look breath-taking (and burn the iPhone Xs), and if the real-world results can meet this standard, Google will really have a breakthrough. Thanks to including not one but two 8-megapixel cameras on the front—one of them wide-angle—the Pixel 3 can capture selfies that offer 184 percent more scene content than what Apple users get via the iPhone Xs. The practical upshot? You no longer need to be the weirdo who totes around a selfie stick. Just zoom out and capture all of your pals. Oh, and if you’re really obsessed with selfie trickery, a new Playground feature can insert augmented reality stickers directly into your shots. You can even pose with an AR Childish Gambino (can we please also get an AR Troy Barnes and Teddy Perkins?). The Pixel 3 supports wireless charging (for the first time in a Pixel phone), and this feature is supported by a new $79 hardware accessory called Pixel Stand. Obviously, it wirelessly charges the phone, as well as any Qi compatible smartphone. But for the Pixel 3, it also turns the phone into something of a smart display, a la the new Google Home hub. Besides wirelessly charging your phone, the Pixel Stand can turn Pixel 3 into a rudimentary version of Google Home smart display. 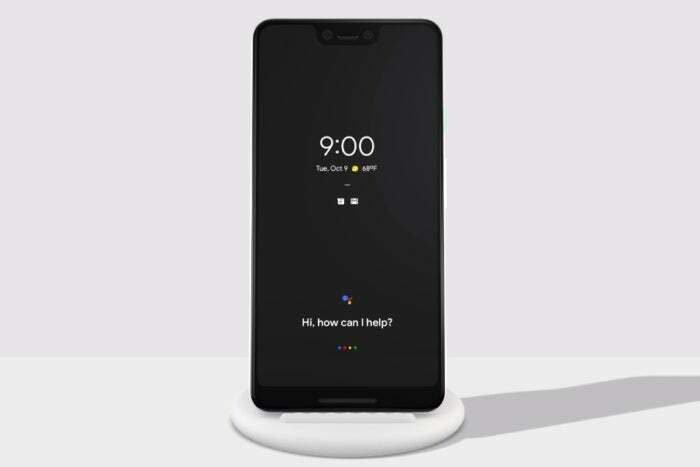 Drop the Pixel 3 into the Pixel Stand, and the phone’s interface automatically turns into a “glanceable” display that puts Google Assistant front and center. You can engage with Assistant via voice prompts or one-touch control buttons, and more easily access Assistant features like the alarm clock, your morning routine, home control, and others. You can wake in the morning to ambient display lighting (whatever that means) and Do Not Disturb will activate automatically when it’s time for bed. Can we all agree that voice calls are annoying, and oftentimes, er... a bit “scary”? Well, get ready for some major software innovation. Google’s new Call Screen feature can enlist Google Assistant to answer calls for you. We can’t wait to try this feature in practice, because it’s a bit unclear exactly how it works. Why talk to spammy callers when you can use Google Assistant to dispatch them forthwith? 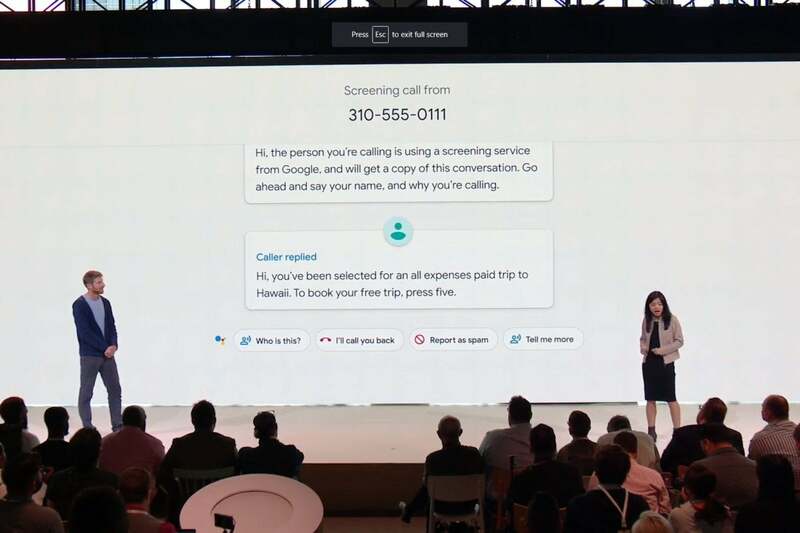 But it appears that when a call comes in, you can instruct Assistant to answer the call, and tell the caller that it’s speaking with a Google A.I. algorithm. From there, you can apparently use one-touch screen prompts to egg the caller along, or tell him or her (or it) to go the hell away. Because come on. Only telemarketers make calls anymore. The two new Pixel 3s share a similar design, though the larger XL has a pronounced display notch to accommodate the front-facing cameras. One of our reporters at Google’s New York demo event described the notch: “It’s very deep. My eyes go right to it.” So we’ll see if his opinion of the notch changes over time. 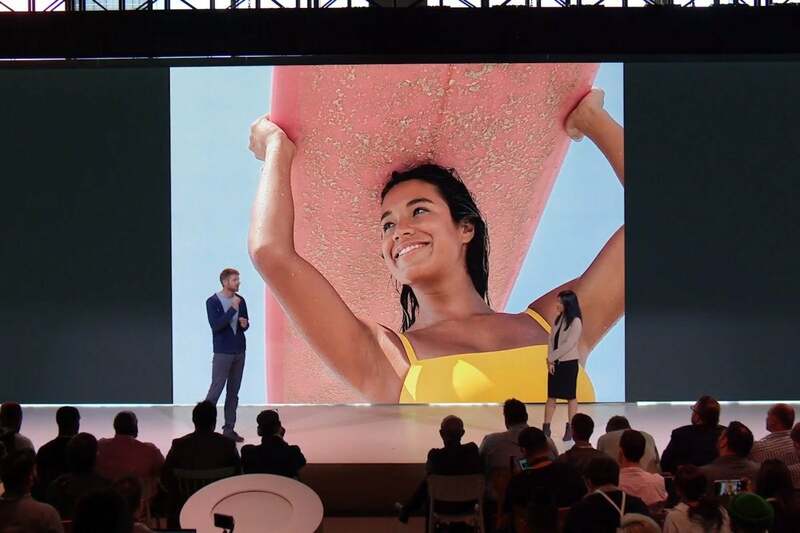 During the event, Google pointed out the new Pixels have an all-glass back, but retain the Pixel 2’s two-tone design with a silky matte finish at the top of the phone. Google retains the front-firing speakers of the Pixel 2, but claims a 40 percent increase in volume. Pixel 3 owners will also get six free months of YouTube Music Premium. And just like with earlier Pixels, if you buy a Pixel 3 you’ll get free unlimited cloud storage in Google Photos for original quality images and even 4K video. In Portrait Mode, you can now edit the amount of bokeh effect you apply to an image (a feature already offered by Apple and Samsung). A Photobooth feature snaps a bunch of front-facing photos and cherry picks the best ones, using machine-learning algorithms to maximum effect. Google Lens now works instantly in the camera app, even when you lack a data connection. A Flip to Shhh feature instantly mutes notifications. So those are the top-line features of Pixel 3. You can pre-order now, or wait to read our first impressions, watch our hands-on videos, or scour our final review.